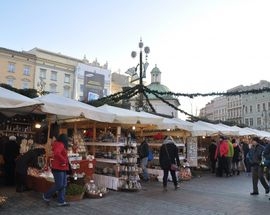 One of the season's most popular highlights is the annual Christmas fair; its twinkling, old-fashioned magic is a huge draw for tourists, and - we dare say - they won't leave Kraków disappointed. Half of the Main Market Square is filled with rustic wooden stalls offering Christmas ornaments, regional crafts, pottery, furs, little angel figurines, woollen socks, gingerbread, mulled wine and beer, delicious warm food, and everything else you would expect at a holiday market of this kind. Add a little snow (we'll see what the weather serves up this December), and you've got yourself a little winter wonderland, somewhat touristy and crowded, perhaps, but perfectly charming nevertheless.